If there was a single disc I would buy someone who just got a Blu-Ray player, 300 is definitely near the top of the list. Although almost any movie will look great on Blu-Ray - very few would suffer as much comparatively on DVD. The reason for this is that the movie is about the great historical battle at Thermopylae where a tiny force of Spartans held off the Persian army for three days. The film is based on Frank Miller's comic book and was designed to look as much like the stylized artwork as possible while still being live action. This involved such amounts of blue-screen that are rarely seen, as well as some novel camera work, and a look-and-feel that is somewhere between virtual reality and live action. Love or hate the technique, it looks crisp. It looks different, and it shows what a comic book adaptation should to at least consider when moving to the big screen. It is also an ultra-violent, gore-fest where the weapon blows regularly “cleave off limbs”, where time is fluid in the pursuit of iconic pictures of mayhem, and the sculpted bodies of the actors rival anything ever seen anywhere else. The physical training necessary to play the Spartans was legendary. The Blu-Ray edition comes in the form of a hard-bound book with pictures from the comic, pictures from the movie, and short bios of the cast. The disc itself, a single one where DVD’s might have two or even three, is loaded with extras. You ask - what are they? There are historical documentaries on the subject matter, including a "300 Fact or Fiction" piece that has a couple of historians, and Frank Miller talking about the accuracy or, perhaps that should be 'accuracy' of the movie. This is a nice piece of work -- while they certainly didn't get historians who just said "uh, no -- it didn't look anything like that. For one thing, the Spartans wore armor"; it is notable that the people they had narrating give us interesting observations without just bashing the film. For instance, they felt that Miller captured the spirit of the Immortals (The 10,000 strong, elite bodyguard of Xerxes) in that the Spartans were very superstitious about them; portraying them as demonic figures in frightening masks was a decent "modern interpretation" of them. It also gives two commentary tracks -- one is on the filming technique; and it shows a picture-in-a-picture which gives us the big screen movie and then the smaller real shot (with blue screens and props); so we can see what it looked like on the set. This is fascinating, but ultimately, a little redundant. The primary film technique they called "the crush" which over-exposed the highlights and under-exposed the shadows making them appear inky-black. This gives us an approximation of Miller's harsh lights and darks, and they did it over and over. They also made sure that many, many scenes had all kinds of CGI stuff in the air (real torches had computer-added sparks flying, real wheat fields had blowing strands of wheat added, and battle scenes had "debris" added to the air – no one was quite sure what that was supposed to be -- but it looked cool). The director's commentary was interesting as well. Zack wanted to cast his whole family, including his daughters as half-seen Persian soldiers; but they couldn't make it up and weren't happy about not being in the shot. It is decent commentary. As always, I want the director to tell me what they were thinking about what is on the screen -- instead of what the cast had for lunch or how much the lead actor and director like each other. There is a reasonable amount of that. I like the fact that one of the writers was told to "make it more weird" so they added bomb-throwing 'magicians' and a Rhino. The DVD calls 300 "the complete" experience, and I think it more or less is. 300 is not my all- time favorite movie, but it was certainly a fairly unique one. It was definitely an intense one. On Blu-Ray, it looks as good even if you are going to see it at home. It sounds fantastic, and it really benefits from the high-definition treatment. The backup material is well constructed and gets you inside the heads of the creators, which is what I, as a consumer of this product, want most. If you want 300 in your library, this is the edition to get. Download 300: The Complete Experience from the iTunes Store in Digial HD. 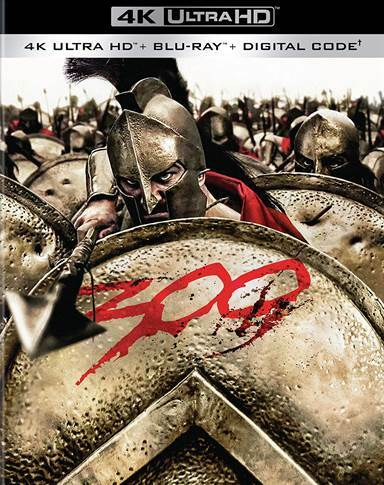 For more information about 300 visit the FlickDirect Movie Database.